Encontrei 73 Hotéis em Les Moitiers-dʼAllonne. Escolha a data de entrada e saída para ver os hotéis disponíveis em Les Moitiers-dʼAllonne. Sem informar as datas, os preços com (*) são preços médios de cada hotel e nos arredores até uma distância de 10 km. Set in Les Moitiers-dʼAllonne in the Lower Normandy Region, this detached villa features a terrace and a garden with a sun terrace. Guests benefit from patio. Free private parking is available on site. The kitchen features a dishwasher and an oven, as well as a coffee machine. A TV with satellite channels is provided. The villa features free WiFi. You can play mini-golf at the property, and the area is popular for golfing and snorkelling. Sark is 40 km from Les Dunes, while Cherbourg is 30 km away. The area is popular for windsurfing and cycling. Entre dunes et mer offers accommodation in Les Moitiers-dʼAllonne, 40 km from Sark and 30 km from Cherbourg en Cotentin. The property is 32 km from Saint Helier Jersey and free private parking is provided. Free WiFi is featured throughout the property. The unit equipped with a kitchen with a dishwasher and oven. A flat-screen TV with satellite channels and DVD player is available. You can play table tennis at the property, and the area is popular for hiking. Barfleur is 50 km from Entre dunes et mer, while Saint Aubin is 36 km away. Maison De Vacances - Les Moitiers D Allonne offers pet-friendly accommodation in Barneville-Carteret, 43 km from Sark. A TV is offered. There is a private bathroom with a shower. Cherbourg is 28 km from Maison De Vacances - Les Moitiers D Allonne, while Saint Helier Jersey is 35 km from the property. Featuring a garden, Maison De Vacances - Les Moitiers D Allonne 1 is a holiday home situated in Barneville-Carteret. A TV and DVD player are available. There is a private bathroom with a bath or shower. Sark is 43 km from Maison De Vacances - Les Moitiers D Allonne 1, while Cherbourg is 28 km from the property. Featuring a garden with a seasonal outdoor pool, La Fafinerie is a detached holiday home set in Barneville-Carteret in the Lower Normandy Region. It provides free private parking. Free WiFi is available . The kitchen comes with a dishwasher, an oven and a microwave, as well as a coffee machine and a kettle. A flat-screen TV with satellite channels is provided. There is a private bathroom with a bath. Free use of bicycles is available at the property and the area is popular for golfing. Sark is 42 km from La Fafinerie, while Cherbourg en Cotentin is 27 km away. Guests can enjoy various activities in the surroundings, including horse riding, cycling and fishing. Bel Gazou is an independent holiday home set in a floral garden, located just a 5-minute drive from the ferry port in Carteret. Barbecue facilities and free Wi-Fi access are provided and parking is free on site. Decorated in a traditional style, this holiday home has a lounge featuring an original fireplace, an LCD TV and DVD player. It has 2 bedrooms and a bathroom that is fitted with a shower and a heated towel rail. Kitchen facilities include an oven, stove, microwave and fridge. You can also use the dishwasher and washing machine provided. Popular activities in the surrounding area include horse riding, sailing and visiting the D-day Landing Beaches, 35 km away. O Relais du Silence Hôtel Restaurant Les Ormes está situado em Carteret, em frente à marina. Situado numa encantadora residência do século XIX, tem um jardim repleto de flores, um terraço e belas vistas para o mar. O Relais du Silence Hôtel Restaurant Les Ormes apresenta quartos elegantes com casa de banho privativa, televisão por satélite, secador de cabelo e banheira. Oferecem vistas para o mar ou para o porto. Um pequeno-almoço continental é servido diariamente no Relais du Silence Hôtel Restaurant Les Ormes e pode ser apreciado no conforto do seu quarto. Aberto para almoço e jantar de terça-feira a sábado, o Restaurante Le Rivage serve cozinha regional da Normandia com marisco fresco. Os hóspedes podem relaxar nas espreguiçadeiras no jardim e tomar uma bebida no terraço ou no acolhedor lounge bar. Há uma biblioteca e são fornecidos jornais diários. O acesso Wi-Fi gratuito também está disponível em alguns quartos e nas áreas públicas. O Relais du Silence Hôtel Restaurant Les Ormes está a 3 horas de Paris e a 30 minutos de Jersey. Existe estacionamento público gratuito no local. Situated in Barneville-Carteret, this holiday home is located 41 km from Sark. Guests benefit from patio. A TV is offered. There is a private bathroom with a bath or shower. Cherbourg is 31 km from Maison De Vacances - Carteret, while Saint Helier Jersey is 31 km away. 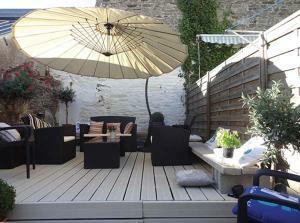 The nearest airport is Dinard Brittany Airport, 90 km from the property. Located in Barneville-Carteret, just opposite the sea, Cateret Townhouse offers self-catering accommodation with a terrace and sea view. The ferry to Guernsey is only a 9-minute walk away. The townhouse features BBQ facilities, a living area with a flat-screen TV and DVD player, a spiral staircase leading to the bedrooms and a bathroom. The kitchen includes an oven, stovetop and refrigerator. Grocery shops and restaurants can be found within walking distance and the train station is only 350 metres away. Cherbourg is a 35-minute drive away and Portbail is 10 km from the property. Hôtel de la Marine features views of Carteret Port and provides massage treatments. It is just 10 metres from pier and offers a panoramic terrace. Free Wifi is provided throughout. An LCD TV and a minibar are standard facilities in the rooms at Marine. Each is decorated in a bright, contemporary style and some offer a large, private balcony with sea views. A continental breakfast is offered every morning and on sunny days, guests can dine on the terrace. Featuring panoramic windows looking over the port, the restaurant and bar and serve seafood dishes. A private parking with five spots is also free on site. Guests can take ferries to Jersey and Guernsey from the port and Cherbourg is 40 km away.